The custom at the Spectrum was to rush the stage during the encore. With so many people the guards were helpless and they knew the show would be ending soon. I remember at least 1 chick roller skating around the stage. We slept out at Gold Medal sporting goods on Bustleton and scored 2nd & 3rd row seats for the shows. Section 101 and 103. Great times. Just like Bob P., this was the first concert I ever experienced. Yes, in the Round, in the Spectrum - an unbeatable combination. Until I saw the set list, I would have sworn they started off with Heart of the Sunrise, because I remember that song so distinctly. Our seats were at mid-arena on the edge of the second level. 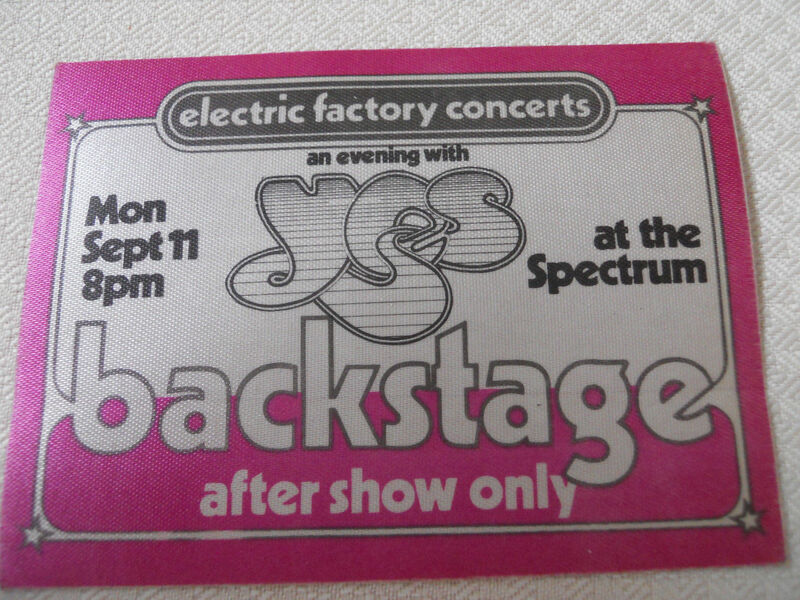 I saw this show with my older brother, who was a Yes veteran. This show made me a lifelong fan of the band - particularly the older music. They are due to be in my town - with the newer singer - in two weeks, March 2013. Looking forward to hearing how they sound after all these years. I recall the soccer match. While I didn't attend I remember hearing all about and there was actually a small print in the Bulletin (remember that newspaper?) about it. It was a well known fact that Wakeman was a huge soccer nut. I remember going to both shows. They were awesome just as all the other folks here have described. Awaken was just phenonmenol! I am curious about something fellow Yes fans in the Philly area - the one thing I have not seen mentioned by anyone is the soccer match that was played at U of P. The guys played soccer against The Fury, I believe it was. It was the day of their second show. There weren't that many spectators, perhaps that is why no one else has mentioned it yet. But it was quite a treat to see my favorite band members out on the soccer field! No, they didn't win, but it was great fun. Anyone out there remember that? I HAVE 9/12/78 AT Philadelphia, Pennsylvania, AND THEY DID DO AWAKEN. This was the first concert I ever went to, and the opening of Siberian Khatru is just seared in to my memory. Oh Yes, this was a fantastic show, and all Philly Yes fans were still reeling from the previous years GFTO tour which was outstanding. We had heard some negative comments about Tormato but any real Yes fan doesn't take the media's word when it comes to Yes. Yes is a spiritual experience. This was an excellent show with a very nice set list... a screaming SK opener from CTTE, followed by HOTS from Fragile and then some new material. I recall the taped version of Jon's son doing the "no lions or tigers or bears" in COH and that fit in nicely. The medley was also very sweet, with a Philly favorite Time and a Word followed up with a highlight for me which included Survival. First off, I would like to thank Pete Wipple for one of my favorite Yes websites on the net. Simply outstanding!!! Now for the lowdown on this show.I was going to blow this concert off since I had something to do.....but after all these years.....I really don`t remember what the hell my other plans were. I remember hearing a live simulcast Yes concert from this "In The Round" tour from some an earlier show and decided, I have to see these guys when they come to their adopted hometown of Philly. What I do remember is this... one of the 2 shows in Philly was sold out, and the other still had a few tickets remaining. I went to the ticketron at Bag And Baggage in Wilmington Delaware and asked if they had any Yes tickets left hoping for tickets that weren`t behind the stage. Now you have to remember,in 1978....this was PC....Pre-Computers....ticketron had concert tickets allready printed up and placed in stacks in mailroom type slots. What they took off the top and handed you were the tickets you got. I noticed there might have been 5 to 6 tickets remaining in this slot and the clerk stated that they were all single seat tickets spread throughout the Spectrum. After deciding that I would go to the show solo, I asked him for one ticket. He was looking at the remaining tickets and with a big grin on his face said..."Your not going to beleive this but heres one single seat for the very first row". ALLRIGHT, my favorite band up close. Driving to the show (by myself), I was wondering...what the stage looked like? was it set up like the Roger Dean stages I have come to love? was it situated in the middle of the venue? at the end? did it take up the entire floor section? WHAT? After moving thru the turnstiles I was somewhat disappointed in seeing this "In The Round" setup. IT was just an ugly round stage stuck in the dead middle of the Spectrum. So disappointed. As soon as I found my seat, my worries soon past.I could stand up and I was like 5-8 feet from the stage. To make a long story short. This concert could rank up their with the best shows ever. Just a perfect,perfect sound. "Siberian Khatru" was and still is the best version I have ever heard them do. The trade off between the elaborate stage vrs the simple stage with the great sound was ok by me. I wouldn`t mind Yes going this route again in the future. 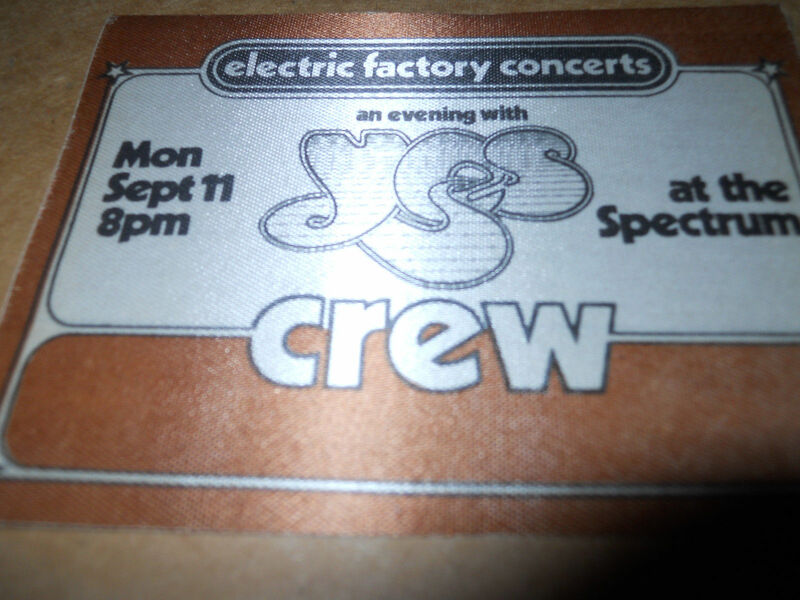 I�ve been to a lot of YES shows since 1975 and remember the Monday night show as one of the best ever. Even though Tormato was not one of my favorite albums, the band played the old favorites with both passion and virtuosity, and was feeding off the crowd�s appreciative reaction. I�ve never seen a more intense crowd at any concert, before or since. Steve Howe worked the crowd into a frenzy during the end of Starship Trooper. I remember seeing my friend Kirk, who was not a YES fan at the time, standing on his first row chair behind the Spectrum hockey boards jumping up and down pumping his fists as Steve passed him by on the moving stage. He later told me it was the best concert he�s ever been to. Yes left the stage at the end of Roundabout and had to basically fight their way through the crowd once they stepped off the round stage (stage was in the center of the Spectrum). The crowd was delirious and wanted them to keep playing. After screaming for about 10 minutes for them to come back out, the house lights came up, and the crowd booed. The next day on WIOQ radio, I remember Jon Anderson telling Ed Sciaky that they wanted to come back out, but felt the crowd was too pumped up and they were afraid to walk back out through it. Someone apparently tried to pull Rick Wakeman�s cape off when they left the stage the first time. Ed told the listeners to calm down a bit for Tuesday�s performance and perhaps YES would play more encores. Went to Tuesday night�s show and as the crowd was getting pumped up during the "Young Persons Guide" into, a loud firecracker went off and the crowd booed at the person right before Yes went into Siberian Khatru. This seemed to take the edge off the crowd for the night and although the concert was good, it didn�t have the same magic of Monday night�s show. I hate to disagree with the previous reviewer, but YES did play Awaken on both nights of the 1978 Philly Tormato shows. It�s my favorite YES song and I distinctly remember them playing it. They played [Philly] two nights in September of '78. I was at both shows and they did not perform Awaken- again my friend with the great memory (and some crappy cassettes to boot-NPI) concurs.